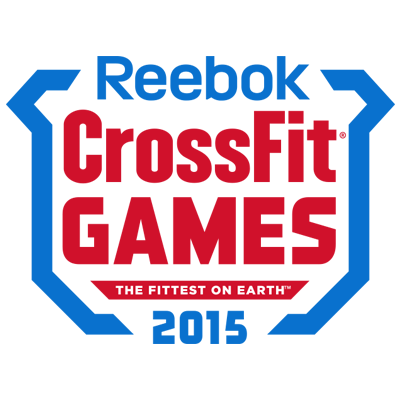 [fusion_text]Reebok in my eyes have held the title too long in terms of the best Crossfit and functional fitness shoe with their Reebok Crossfit Nano’s so it’s about time someone else stepped up to the mark. Who else could take on a sports brand who sponsors the Crossfit Games and holds a sponsorship with the fittest man on the plant Rich Fronning other than Nike who have been making legends from their footwear for years with their Air Jordans. 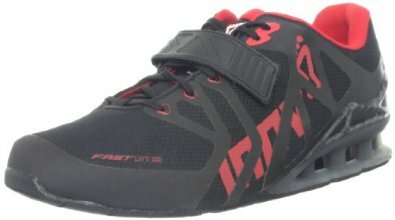 I’ve always liked the look of the Reebok Nano’s but the thing I didn’t like was that they were way too popular and I like to have something a bit different so I’ve opted for the Inov-8 F-lites for wod’s and the inov-8 fastlift for oly lifting, which have served me well over the past year. One thing i would say about the Inov-8 flites is that they don’t feel very sturdy on the toe area and have started to wear and tear a bit now due the softness of the toe area. It was no surprise when the “Nano Gate” conspiracy happened back in January when Reebok supposedly made a mistake by selling the newest model Reebok Crossfit Nano shoe for £18.50 instead of £85. Low and behold news spread like wildfire on social media nearly crippling the Reebok website with visitors who fought to kit themselves and flood every Crossfit box in the UK with the Nano 4’s just weeks before Nike were set to launch their eagerly anticipated first dabble in the functional fitness shoe arena with the Nike Metcon 1. I’m not going to lie I jumped on the bandwagon and bought myself 7 pairs of the Nano’s one for each day of the week no doubt but only on talking to a couple of mates my Box I go to Crossfit Caerphilly they said they weren’t the comfiest of shoes in the Reebok lineup and were nothing compared to the trusty old Nano 2’s saying they were like slippers and felt like they were walking on pillows. 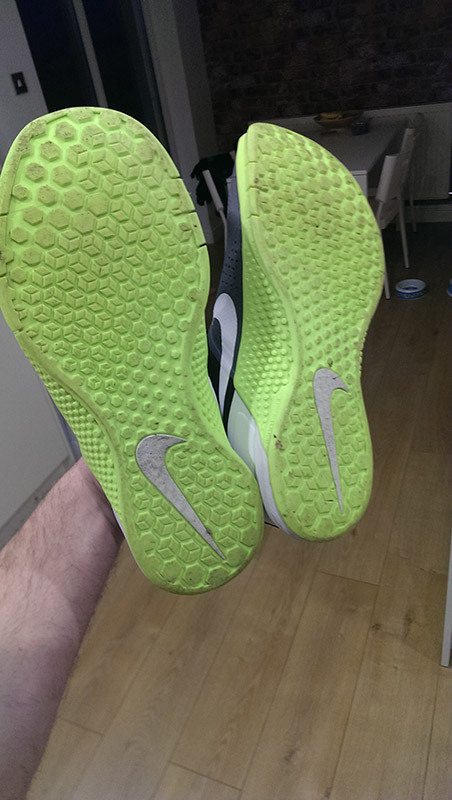 One of the guys even put his Nano 4’s up for sale after a few wears to fund a pair of the Nike Metcon 1’s after not taking to them very well. I have to admit they looked more sturdy than my Inov-8 flute 230’s with the front toe box protection but it was the sturdiness that were putting people off they just weren’t as flexible as some of it’s predecessors. 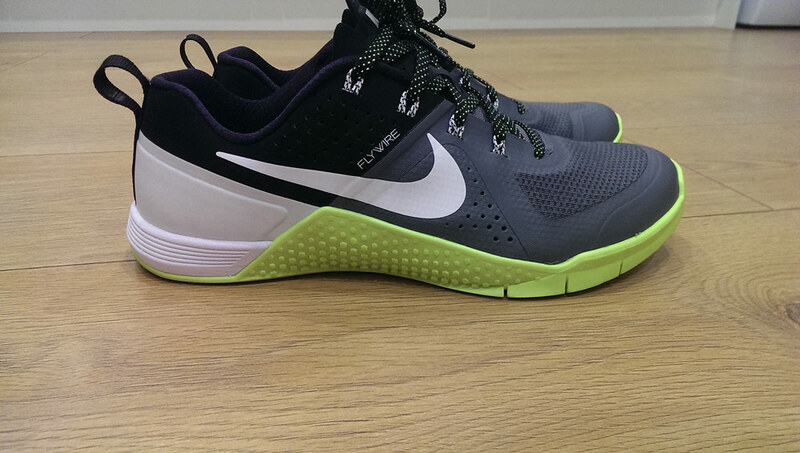 I ended up selling all but one pair of my Nano 4’s and managed to bag myself a pair of the Nike Metcon 1’s two weeks after launch on ZALANDO.CO.UK as I woke up at 9.30am on the release date just 30 minutes after launch time and they had flown off the website for the colour i wanted the grey volt with it’s instantly recognisable yellow/green sides for rope climbs as opposed to the slightly bland black dark grey option. I’ve worn the Nike Metcon 1’s twice now, managed a PB on the first go on power clean adding 5kg and just 5kg from my target of 100kg. The WOD that day was a good test too with 10 rounds of 10 x 20kg plate GTOH and 10 box over jumps giving meaning they got tested squating and snatching needing good footing and stability and then the box overs giving a good grip and also balance when landing on the other side. What i like most about the shoe is the fit and the durable mesh fitting on the toes which cling to your feet , the flywire adds to the fit as I have quite small feet a UK 7 in fact my feet are quite short but they are a bit wide so i always find it hard to get a decent fit as they are either too narrow or too long on the toes but these fit just right with more toe protection on the Nike Metcon 1’s compared to my old Inov8 flite 230’s. The grip on the bottom looks a lot more hardwearing compared to the Inov-8 which although have lasted me a good year of use they are a bit too flexible if you ask me and they will bend any shaped you bend the sole but it’s good to have a bit of sturdiness in the sole for protection on the box jumps and wall walks. I also tried them yesterday not at Crossfit but my local gym who put on some good functional fitness circuit classes called warrior and spartan with battle ropes, tractor tyre flips, sledge hammer slams, kettle bells, prowlers, farmers walks and barbell moves. The shoe doesn’t look like they’ve been worn just a bit of dirt on the soles which i would expect for £100 price tag, which is 15% more than the Reebok Nano’s and around the same price as the new Inov-flite 235’s. I was going to go for the new Inov-8 flite 235’s after being quite impressed with my current flite’s but i wasn’t overly bowled over by the launch colours with luminous yellow and black for the guys and blue and pink for the ladies plus two people from my box had bought them for Christmas and i didn’t want to copy. I noticed they released a grey and black pair in the States too that hadn’t been released here so i was going to wait for those until i heard about the Nike Metcon 1’s and i’m glad held off buying them and that I got rid of all 6 pairs of my bargain Nano’s for the Nike Metcon 1’s as all my feedback is positive at the moment and would definitely recommend them. If you’re not convinced on what pair to get Zalando is the only website that sells all 3 of the only players in the game of crossfit shoe ‘s as far as i’m concerned and that’s Reebok, Nike and Inov8 so you could order a pair of Reebok Crossfit Nano 4’s, the new Inov8 flite 235’s and they still have some black Nike Metcon 1’s in stock. They have restocked the site unlike nike since the launch as they initially sold out too but I managed to get mine 2 weeks later. They are the only two places to stock the new Nike Metcon 1’s as I rang my local Nike store in Cardiff on the morning of the launch date after I missed out online and they said they were only selling them in their Flagship store in London and online. [/fusion_text][tagline_box backgroundcolor=”” shadow=”no” shadowopacity=”0.7″ border=”1px” bordercolor=”” highlightposition=”top” content_alignment=”left” link=”http://tees-n-cheese.co.uk/cheapest-nike-metcon-2-in-the-uk/” linktarget=”_self” modal=”” button_size=”” button_shape=”” button_type=”” buttoncolor=”” button=”Check out the new Nike Metcon 2″ title=”New Nike Metcon 2’s released!